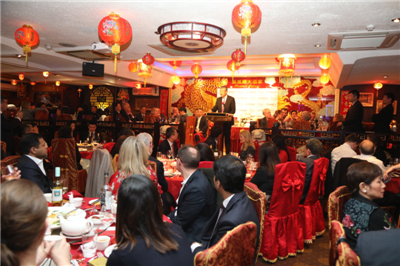 On February 27, Ambassador Liu Xiaoming attended the Annual Gala Chinese New Year Banquet 2019 hosted by Chinese for Labour in the UK. About 160 guests were present, including the Rt. Hon. Jeremy Corbyn MP, Leader of the Labour Party and his wife Laura Alvarez, the Rt Hon Dame Rosie Winterton MP, Deputy Speaker of the House of Commons, Dawn Butler MP, Shadow Secretary of State for Women and Equalities, Andrew Gwynne MP, Shadow Secretary of State for Housing, Communities, and Local Government, Barry Gardiner MP, Shadow Secretary of State for International Trade, Peter Dowd MP, Shadow Chief Secretary to the Treasury, Sonny Leong CBE, Chair of Chinese for Labour, and Lords and MPs of the Labour Party, as well as representatives of business, culture, education, and media sectors in the UK and overseas Chinese. Ambassador Liu delivered a speech entitled Put People First and Deliver Benefits to the People. 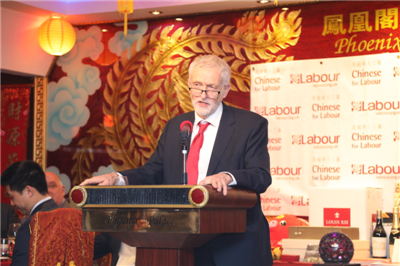 He spoke highly of Labour Party's contribution to the development of China-UK relations and stressed that putting the people first and working for the many was not only the goal but also the foundation of China-UK relations. This year marks the 70th anniversary of the founding of the People's Republic of China, he said, and it is also the 65th anniversary of the establishment of China-UK diplomatic relationship at the level of chargé d'affaire. He called on China and the UK to stay committed to doing three important things in order to deliver more benefit to the people of the two countries. The first is to stay committed to open cooperation, so as to deliver the benefit of cooperation to the people of both countries. The second is to stay committed to exchanges and mutual learning, so as to gain more popular support for China-UK friendship. The third is to stay committed to peaceful development and work together to build a community with a shared future for mankind. The Ambassador said, "China attaches great importance to strengthening relations between the political parties of our two countries." 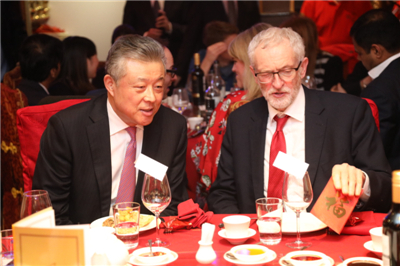 He encouraged Mr. Corbyn and Labour Party delegations to visit China at a time convenient to both sides, and hoped that the Labour Party would take an active part in the 11th China-UK Leadership Forum. Ambassador Liu also expressed his appreciation to Chinese for Labour for their commitment to encouraging the Chinese community to get involved in politics and their efforts to enhance the dialogue and exchanges between China and the UK over the past 20 years since its establishment. He hoped that Chinese for Labour would make greater contribution to China-UK understanding and friendship. 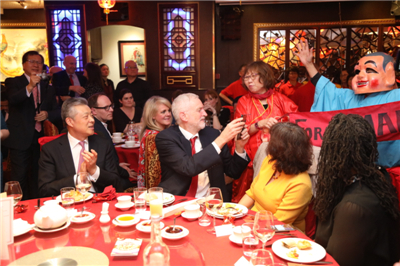 Corbyn said in his speech that as a country with a long history and splendid culture, China had made significant contribution to the development of world civilization. He noted China's rapid development over the past decades, leading to increased comprehensive national strength, extraordinary achievements in economy and trade, technology, culture and education, rising international status and influence, and important contribution to the common development of all countries in the world. As China-UK cooperation is of mutual benefit, he said, the two sides should promote the mutual understanding and mutual learning of the youth in particular, which is beneficial to both countries and future generations. 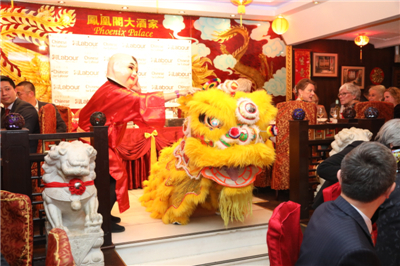 The Labour Party has maintained friendly relations with China for a long time, he added, saying he is willing to lead a Labour Party delegation to China at a convenient time and actively participate in the UK-China Leadership Forum, so as to make new contribution to the exchanges and cooperation between the two parties and two countries. 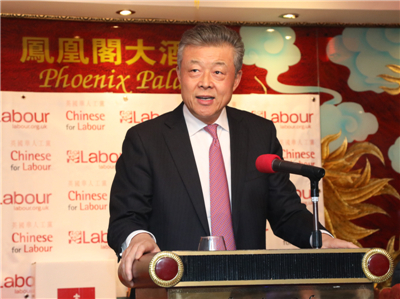 Sonny Leong reiterated the support of Chinese for Labour for the Party's manifesto of "for the many, not for the few" and vowed to play an active role in this regard to safeguard the rights and interests of the Chinese, promote their own development and contribute to China-UK friendship and cooperation. At the event, the site was brightly lit and filled with festive warmth. Volunteers from the Chinese community performed a wonderful lion dance. The guests talked about China-UK friendly cooperation and hoped that a steady and enduring China-UK "Golden Era" would bring more benefit to the people of the two countries.